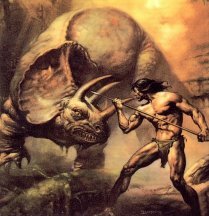 Pal-ul-Don is a nation described by Edgar Rice Burroughs in 1921 in his classic novel Tarzan the Terrible. For those who are unaware of the story, during the Great War (nka WWI) a German Lt. Obergatz burned the Greystoke plantation in Kenya and made it appear as if Jane, Lord Greystoke’s wife, had been killed. 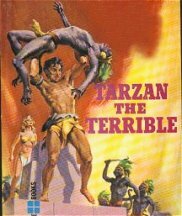 The ensuing revenge of Greystoke against the German army in Africa was told in Tarzan the Untamed and concerns us only as a prequel to the main novel. After devastating the German army, Greystoke discovers that his beloved wife, Jane, is not dead but has been taken west or southwest by Obergatz and the Lord of the Apes follows. After months of searching and blind trails, he discovers an almost impassible morass in the north or northeast area of the Congo Free State (nka Zaire) and upon crossing he discovers an isolated land filled with marvels of nature. 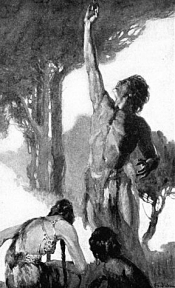 The most interesting form and one central to the novel is the discovery of a race of people unknown to modern science. The Waz-Don live in Kors, caves cut into the gorges of the mountains of Pal-ul-Don while the Ho-Don live in cities carved from living limestone. 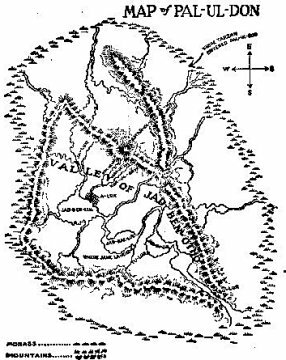 From the text and a map drawn by Burroughs, we know of four cities (A-lur, Ja-Lur, Tu-Lur and Bu-Lur) and two kors (Kor-ul-Ja and Kor-ul-Lul with a possible Kor-ul-Bu). There may be more of each. Pal-ul-Don itself is a large area of about 3500 square miles (9065 sq km or 2,240,000 acres) in an area that stretches about 70 miles (112.67 km) north to south and 50 miles (80.5 km) east to west. This is the size of the island of Cyprus or Puerto Rico. These numbers are postulated by charting Greystoke’s travels within Pal-ul-Don and calculating the approximate distance he could cover in a day. Thus isolated, evolution in Pal-ul-Don runs riot with new form diverging from the norm. For ease of understanding I refer you to ERBzine 0107: Geography of Pal-ul-Don. Within this morass lie three great mountain ranges, the western, the central and the northern branch. For sake of ease I am naming the western range “Ben-Ved”, the southern part of the central range “Bu-Ved”, the northern part of the central range “Ko-Ved” and the northern range “Ta-Ved”. Between the western and central Ranges lies a well-watered valley where the majority, if not all, of the population lives. This valley is called Jad-Pele-Jad-Ben-Otho (The Valley of the Great God) and contains four lakes (Jad-Ben-Lul, Jad-Bal-Lul, Jad-in-Lul and Jad-Bu-Lul) and a number of rivers and streams as well as all of the named cities and kors. To the north lies a V-shaped valley bordered on the SW by the Ko-Ved and on the NE by the Ta-Ved with the morass to the NW. East of the Ta-Ved and Bu-Ved ranges lies another, unexplored plain and south of the Ben-Ved lies a smaller plain. Both of these plains are unexplored and may possess Don populations of their own. The northern valley appears to be either uninhabited or sparsely inhabited. Prior to the Great War of 1918, it was customary for every Ho-Don city to drown one infant at sunrise and knife one adult at sunset in sacrifice to Jad-Ben-Otho (the Great God). Before you judge these people, remember that even early Judiasm sacrificed their first-born son to Jehovah until the Abraham event ended this practice. However, I am not examining the morality of the practice but the practice itself. When you do the math, you find that 365 babies plus 365 adults times 3 and possibly 4 cities per year requires 2190 to 2920 people killed every year in a very small area. Add to that the constant warfare between Ho-Don and Waz-Don and possibly between different cities of the Ho-Don and add to that hunting deaths and accidental deaths, you find that the yearly death toll may very well be as high has 5000 per year. It is obvious that the population of this very small area must produce at least that many children per year to simply offset natural and artificial deaths. The birth rate in Pal-ul-Don must be astronomical with the adult women in almost constant pregnancy. Then in 1918 comes Lt. Obergatz, now insane and impersonating The Great God, a feat made simple by the belief of the Ho-Don that Jad-Ben-Otho is tail-less. Does this hearken back to an earlier visitation by an outside human carrying a firearm? We will explore that in a later paper. Ordinarily this would be unimportant other than to compare it to Jesus appearing in Rome and telling the world that the Catholics are right. No one outside Italy would believe or care but it would reinforce Catholic doctrine within the Church, as Obergatz reinforced Temple teachings within the Ho-Don cities of Pal-ul-Don. 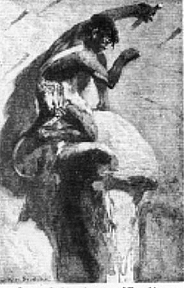 But wait, at the same time comes Greystoke, called Jad-Dor-ul-Otho (the Son of God) who is also tail-less but opposes Obergatz. This is as if Jehovah were to appear in Tel Aviv and Jesus in Rome and filial conflict caused them to start a war to see who, father or son, was right. In this case, the arrival of Korak with his Enfield battle rifle and a few well-placed cartridges removes both Obergatz, the ‘Great God’ and the major priests thus leaving a power vacuum in the church and the absolute proof that the Son of God is right. So now the Son of God makes peace between the Ho-Don cities and the Kor-ul-Ja and he outlaws human sacrifice then leaves upon the back of an untamable engine of destruction, the Gryf, again proving his divinity. Miracle upon miracles. There haven’t been this many miracles in the outer world since Moses. Burroughs never returns to Pal-ul-Don so we have no idea of what the results of Greystoke’s intervention are. But we can guess. First of all, with peace between the Ho-Don, deaths by war drop. With the alliance between the Ho-Don and the Kor-ul-Ja, deaths by interracial war drop. With this alliance, the Kor-ul-Lul and other kors will be unwilling to war upon the Kor-ul-Ja or the Ho-Don fearing a united reprisal so peace ensues and deaths by war vanish. Second of all, with human sacrifice outlawed by Divine Decree, those 3000-5000 sacrifices per year live. With a birth rate developed to offset more than 5000 deaths a year (how many die in war and slave raids to collect sacrifices is anyone’s guess, but I would place it at another thousand) the population explodes. Each city MUST produce at least 1000 people per year just to survive the decimation of religion and war. These thousand now live and reproduce. The smallest city must have at least 4000 people just to survive. Two thousand to breed the thousand to die and 2000 to replace deaths by age, hunting and accident. So the smallest city has 4000 people which is a stable population that has not grown for centuries. The next year, the population is suddenly 5000. The year after that 6000, the next year 7000. By 1922, only five years after sacrifice is outlawed and peace enforced, the population doubles. In ten years, 1932, it doubles again. In 20 years, 1942, these newly living reproduce and suddenly the population growth switches from arithmetic to geometric. By WW II, the population of Pal-ul-Don has gone from a stable one to sixteen times as much! Even if I am exaggerating, an eight-fold increase is the absolute minimum. Now consider that the society and technology is stable too. The people are in bronze or early steel-age. Weaving is unknown, metalwork is done in small charcoal forges. Gardening is simple and the plow is unknown as are domesticated beasts of burden. Farming is probably dibble-stick and shovel and so is subsistance only. The land has always been bountiful so there has never been a real need to store foods. Now the population is exploding and the Don are forced to clear more forest for farms and hunt more game and fish more. In a land the size of Cyprus, how long can you do this before you empty the lakes and forests of game? How much can you farm with a shovel and dibble-stick before you reach the maximum yield? The outer world survived these problems because they occurred during the industrial revolution and science was competing between nations, each discovery paid for by technological inventions. Consider this, between the dawn of man and the Crusades, only seven metals were known (gold, copper, silver, lead, tin, iron and mercury). It took the entire earth throughout the Middle Ages AND the Renaissance to discover another four (arsenic, antimony, zinc and bismuth) and this was the entire planet sharing ideas and technology and ideas and solutions for problems. Hundreds of nations, each with a different view to a problem, all working to the goal of advancing science before the other guy could. By the discovery of the New World by Columbus, only 11 metals were known. Pal-ul-Don probably is restricted to the first six and with no other nations to inspire invention, there they remain. Thomas Malthus calculated that Earth would be starving by the late 17th century. He didn’t count on the Industrial Revolution to create new ways to eat. Had this revolution not occurred, humanity would have been decimated. Malthus was lucky. The Don aren't. With increased and explosive population comes crowding, and with crowding comes sanitation problems. Sanitation problems cause disease and without technology to develop vaccines, epidemics run rampant. The question is which exterminated the Don first, epidemics like choloria and typhoid fever or mass starvation and cannibalism as happened on Easter Island? Or did Obergatz or Jane arrive bringing an outside disease such as the common cold or flu, to which the Don were unprepared? Ninety per cent of the American Indians were killed not by European firearms, but by European diseases. Both Jane and Obergatz were weak and starving and had passed through one of the most disease-ridden places on Earth before entering Pal-ul-Don. Could their weakened immune system have carried a disease that they survived as their health improved, a disease that found the Don unwilling and helpless hosts? Regardless of the incident, starvation by over-population, disease by over-population or an introduced illness, by the time of the 1950s, Pal-ul-Don is dead, its population almost extinct and with too few numbers to recover. The first outsiders with a firearm and a taste for gold to discover the land would gladly exterminate the few survivors to get rich. But wait, there is another scenerio. The 1940-1950s were a time of repeated droughts in Africa. Famines killed millions. The lakes and marshes dried and crops withered on the vine before the rains returned. The marshes dried? Even the marshes that protected and isolated Pal-ul-Don? An expanding population desperate for room and farmland and food would see the drying morass as a sign that The Great God wanted then to leave Pal-ul-Don and live in heaven. Masses of people would cross the morass, some seeking heaven, some seeking food, some seeking escape from the crushing burden of people. And what did they find? A form of human that resembled god but were far weaker than a child. Remember Greystoke’s comments when he first met the Waz-Don, Om-At? 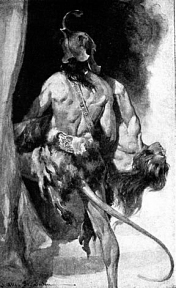 If the Don possess “superhuman strength” according to one who is himself of superhuman strength, how long would it take the Don to realize that the outer humans were not gods but simply weak people, lop-tails whose lands were ripe for conquest. The starving hoards of Don would quickly grasp the lands and enslave the Africans because why enslave a Waz-Don who is as strong or stronger than you when you can take as slave someone so weak that even a woman could best them in a fight? Quickly the word would return. Here is land and food and slaves for the taking. Even the Waz-Don would join in for they, too, are starving from overpopulation and these hairless people are weak too. And as the Waz-Don believe that the Great God is tailed, seeing populations of weak hairless tail-less people would have no religious ramifications at all, they would see the humans as simple prey. The Don would meet firearms, of course and this would terrify them… at first. But eventually, quickly in the case of the Waz-Don, they would see firearms as not the instruments of divine retribution, but as simply another weapon, a weapon they would quickly take and master. At this time much of Africa is concerned with survival, not some unfounded rumors of giant monkeys conquering the nation. The Mau-Maus are rising in British Kenya. Other African Nations are fighting for independence from the tyrannical yoke of European rule. They have more important things to do than divert valuable resources to a rumor. After all, there are rumors of dinosaurs in Africa, Bigfoot in America, Hairy men in China and Yeti in Nepal and Tibet. This is one more story and when you are concerned with filling your stomach and striving to survive a revolution, rumors are just that. By the time the rumors are proven as fact, the Congo is firmly under Don rule. Humans evolved as plains animals. Danger came from the grass so we evolved the instinct to look down for danger. When we hide, we hide under a bush. When we search we search under bushes. Not so the Don. They evolved in an arboreal environment. They look up and down, they seek up and down and they hide up, away from the gryf, the ja and the jato. Human soldiers, hastily assembled to oppose these monkey-men are searching the grass, the bushes, the valleys and pass under trees filled with Don wielding clubs with super-human strength. Reflexes honed by fighting Ja and Jato with a knife do well against slower and blinder human soldiers, who are trained to fight only their own kind. The Don drop onto the armies and the human soldiers are dead before they know danger is near. Now the Don have modern firearms. The smarter chiefs capture the soldier’s leaders and make an offer. “Join us, teach us and live or refuse and we splatter your brains across the ground.” Some refuse and die, others agree. The smart ones say, “Toss in that diamond encrusted belt-buckle and my loyalty to you is ensured.” The Don learn the value of worthless gold. They now buy arms and mercenaries. And they buy food. Villages which would fight and die now swear loyalty for a bag of rice to feed their starving children. The Don promise safety from their enemies and so expand. By the time Europe discovers the menace, for who would believe stories of giant monkeys conquering armies and nations, much of central Africa is firmly under Don control. Then they stop. The Don are not conquerors, they are warriors. If they were a conquering folk, they’d have long ago expanded to all of Pal-ul-Don. Their population is no longer stressed. They have enough land to farm, enough slaves to work the land. Why conquer and die when you can hold what you have. Farmers hate war, it’s bad for the harvest. So the Don send tons of gold to the UN. Gold to feed the hungry, gold to buy the presidents and Prime Ministers, gold to ensure that the UN recognizes the Don’s conquest as legal. The Don are not cruel masters. When the Son of God outlawed sacrifice, many Ho-Don freed their captives and sent them home, for why feed slaves you do not need? As the local humans are freed and given a choice, take gold and leave Don lands, most do. Why dig for a few roots to eat at home when you can buy a farm in another, better country. And with the Don birth rate, soon they outnumber those who remain and Zaire, Central African Republic, Congo and Uganda are Don nations. Well, at least Idi Amin is gone so the Don can’t be all bad. Some of these nations are ruled by the Ho-Don of A-Lur, others by the Waz-Don of Kor-ul-Ja and others by the Waz-Don of Kor-ul-Lul. Do these empires live in peace or do they once again, take up their ancestral wars? With the Don population climbing again, Africa and eventually Europe can only pray for the latter. 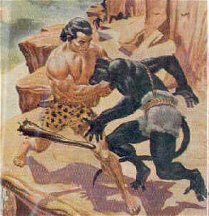 I started reading the works of E. R. Burroughs as did everyone else of my generation, via the Tarzan comics you could buy for a dime in a drug store. By Junior High School, I discovered that the comics were based on a series of novels and from then on I was hooked and began to purchase as many hardback and first or second editions as I could afford. Being a Virgo, I also asked questions as to how this world could exist and toyed with my own theories and drew my own maps over the decades. It has only been recently that I have begun to introduce my ideas to the world at large, and the existence of websites like this have answered some questions, created others, advanced and countered my own theories and encouraged me to expand my own writings, which include stories of Barsoom, Pal-ul-Don and recently, Caspak. The former two being my favorite locations. Oh, right, I am divorced and in addition to a dozen jobs, I am retired from a career in the USAF where I spent more than two and a half decades as a civil engineer making lives better by such actions as fighting forest fires, building schools and hospitals and generally creating pleasant memories with which to bore my children. And yes, my youngest daughter has become hooked on the Master and we often have conversations dealing with the problems of inter-breeding between the races of Earth and Mars, the social problems of being raised by an ape and why do all these aliens look the same? I also teach religion, kayak, practice martial arts including kendo, karate, fencing and archery and feed the hundreds of wild birds that have discovered that I am a soft touch. Today, I live with my youngest daughter, dwarf bunny and cat, all of whom are rescue animals. ERBzine 1370: Mapping Barsoom I: Can It Be Done?